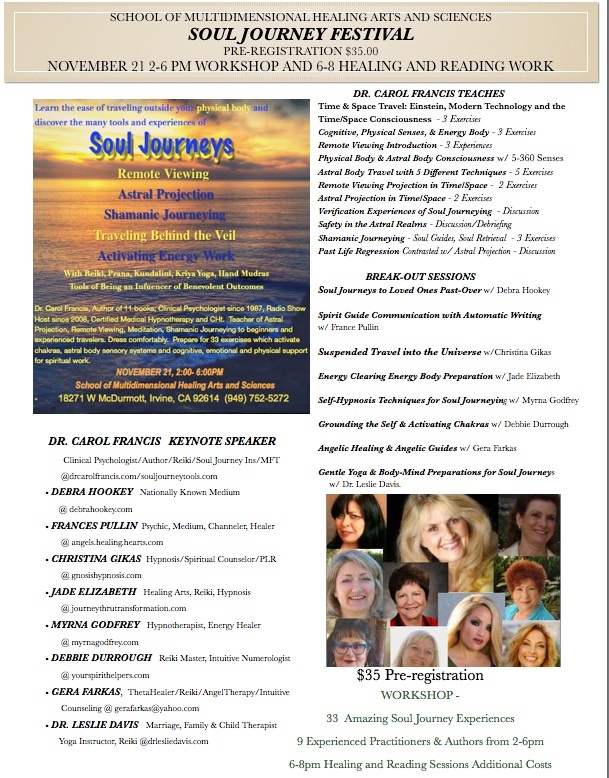 Joining Dr. Carol Francis is Dr. Leslie Davis, Dr. Christina Gikas, Gera Farkas, Jade Elizabeth, Debra Hookey, Debbie Durrough, Frances Pullin, and Myrna Godfrey. Dr. Carol Francis is a Clinical Psychologist, Author of 11 books, Certified Hypnotherapist, Reiki Master and teaches national about astral projection, shamanic journeying and aspects of remote viewing. She can be reached at drcarolfrancis.com or souljourneytools.com. Debra Hookey is a nationally Nationally Known Medium. Learn more at debrahookey.com. France Pullin is a psychic, medium, and channeler and author I Am Mozart. Learn more at angels.healing.hearts.com. Dr. Christina Gikas is a Certified Hypnotherapist who offers a variety of assistance with psychological, physical and spiritual concerns and is reachable at gnosishypnosis.com. Jade Elizabeth practices hypnosis and Reiki and a variety of alternative healing arts. Learn more at journeythrutransformation.com. Debbie Durrough provides sound-based healing meditations and also practices Reiki as a Master and is an Intuitive Numerologist. Learn more at yourspirithelpers.com. Counseling and is reachable through gera@dolphinwatershealing.com. Dr. Leslie Davis is a licensed Marriage, Family & Child Therapist, Yoga Instructor and Reiki Practitioner and can be contacted at drlesliedavis.com. Payment for Soul Journey Festival – $35.00. Please leave your email for further materials (MP3, Video, Publications) on Soul Journey work provided free before workshop. 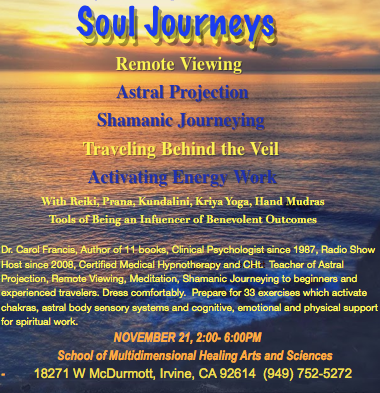 Join us Nov 21, 2-6 2015 in Irvine. See image for details ad listen to Dr. Steve G. Jones interview with Dr. Carol Francis on Astral Projection.